So, we have recently developed/joined a dinner club. It is the two of us along with five other couples. Our plan is to get together once a month and alternate between hosting dinners at each of our homes and visiting local restaurants (in Nashville, TN). Some of the couples we know well and some we don’t. We’ve met twice so far, and it’s been a blast. The first dinner was at my house. The best recipe to recommend was dessert: Blond Texas Sheet Cake with Caramel-Pecan Frosting. I cut rather large pieces and I think everyone pretty much licked their plate. Tony said it’s one of the best things I’ve ever made. The frosting recipe says to toast pecans in the oven. I put them in a pan and sautéed them with a little butter, brown sugar and bourbon… delish! 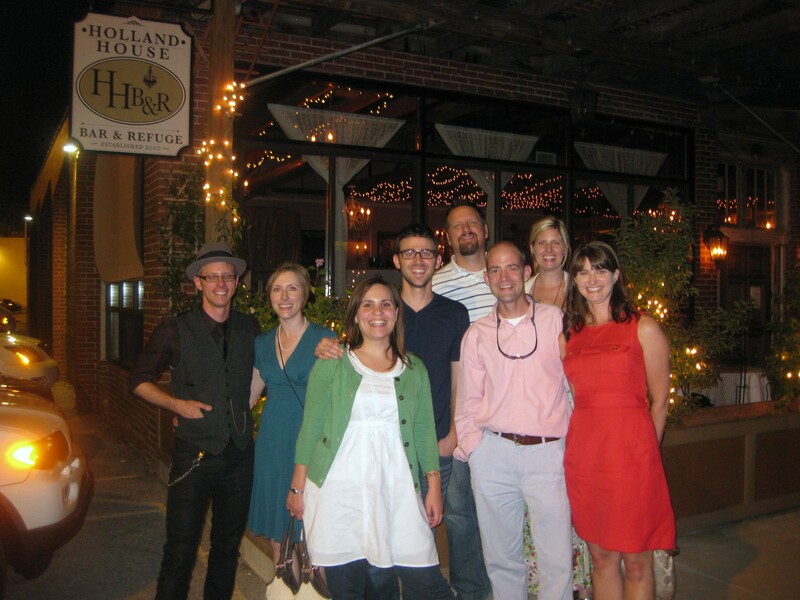 Our second dinner was this past Saturday night and we visited Holland House in East Nashville. One girl is vegan, and the chef kindly made her a dish of gnocci that wasn’t on the menu – she said it was wonderful. Of the group, we tried their truffled popcorn, fried yellow tomatoes, steaks, risotto, salmon, the blue cheese burger, grilled romaine with gorgonzola and there were other plates that I didn’t even get to see. Everything was very tasty and I’d definitely go back.